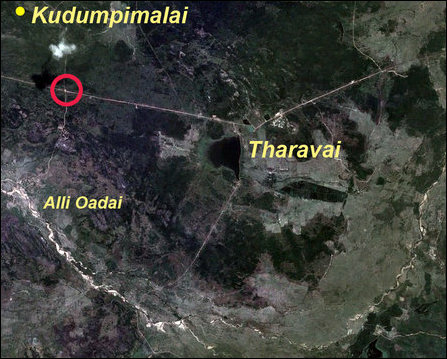 The people of the area further said that the Sri Lankan military had told them that the lands surrounding the junction would be made into a 'Sinhala-Buddhist sacred area’ after they construct the stupa there. Alli Oadai Junction is also known as the 9th mile-post junction in the Vadmunai Kiraan road. The Tamil name, Alli Oadai has been Sinhalicised into Aliya Oluwa in Sinhala. The Kudumpi-malai hillock is locally believed as an abode of God Murukan. A Buddha statue has been placed there now. The local people are also prevented from visiting a nearby Ka'n'naki temple in the jungle area, where they traditionally perform annual rituals like Madai and Ku'lirththi. Last year, the SLA soldiers grabbed 500 acres of land, used by Tamil farmers as grazing land for their cattle in the Tharavai area near Kudumpimalai. Some of the occupied lands were also deployed for establishing a military training base for the SLA. Later, more lands were grabbed near the coastal part of the division and several thousands of rarely available herbal plants were destroyed in the name of ‘urban development and tourism’. Colombo has been scheming intense demographic changes to the division with an aim to annex some of the villages with the neighboring Polonnaruwa district, similar to grabbing parts of the Mullaiththeevu district in the north to annex with Anuradhapura district. Cutting the contiguity of Trincomalee and Batticaloa districts in the East is the idea. 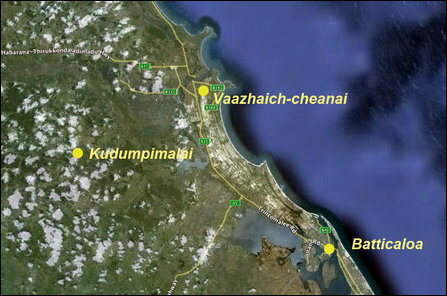 Civil sources in the district say that the Colombo government has been implementing a covert plan to destroy the economy of Tamils in Batticaloa district by preventing them from their livelihood activities in the main four areas, paddy cultivation, subsidiary food crop cultivation, animal husbandry and fishing, both inland and in the seas. Only Sinhalese are being allowed to do inland fishing in Tamil areas of Koa'ralaippattu South. Tamil owners of cattle have complained that about 150 heads of their cattle were shot and killed by SLA in recent months. Sri Lanka is allowed to peacefully proceed with the structural genocide of Eezham Tamils, while countries in the UNHRC squabble over the failed 'war crime-reconciliation' paradigm of the USA. 11.10.11 Forest destruction, land grab go unabated in Batticaloa: TNA..
28.07.10 SLN constructs new coastal bases in Eastern Province despite..